Designs for Health is another company I partner with that sells excellent quality food and nutritional supplements. I highly recommend checking them out! Below are the products that I most often refer my clients to try. If you have questions or would like more information on Designs for Health products, contact me. This top quality protein powder comes in two flavors: chocolate and natural vanilla. 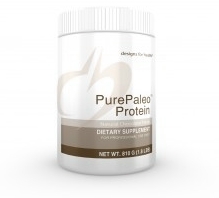 It is the ultimate protein supplement for those who are on a Paleo diet. PurePaleo™ Protein is a novel, great-tasting, dairy-free protein powder, yielding 21 g of protein per serving. It contains HydroBEEF™, a highly concentrated, pure beef protein, produced through an exclusive proprietary process that allows the protein to be hydrolyzed into more peptides, resulting in easier absorption and assimilation. 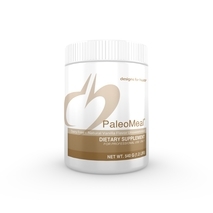 PaleoMeal™ is a powdered nutrition formula designed to promote peak wellness by optimizing patients’ intake of proteins, fats, carbohydrates, and micronutrients. The ingredients make this formula ideal for patients needing support with weight control, GI health, detoxification, immune issues, heavy metals, and muscle gain. PaleoMeal™ is made with exceptional quality whey protein, which comes from herds that graze on pesticide-free, chemical-free natural grass pastures. These milking cows are never given bovine growth hormone or any other hormones (No rBST or rBGH), genetically modified organisms or injected pathogens. This whey protein is never exposed to high heat temperatures. The result is the highest quality protein supplement, rich in immunoglobulins and lactoferrin. PaleoMeal™ is designed to help promote an optimal intake of protein, fats, carbohydrates, vitamins and minerals needed for overall wellness. PaleoMeal™ is made with an exceptional quality whey protein concentrate, which comes from milking cow herds that graze on disease-free, pesticide-free, chemical-free, natural grass pastures. These milking cows are not subject to any chemical, genetic or hyper-immunization influence. They are never given bovine growth hormone or any other hormones. No rBGH or rBST. They have no history of bovine disease and have never been fed any cannibalistic by-products. This whey protein concentrate is produced to maintain the fragile components naturally present in whole fresh milk including the immunoglobulins, lactoferrin and bovine serum albumin. The result is the highest quality protein formulation available. Whey protein is nature’s richest source of biologically active protein. Unlike soy protein, which is low in the amino acid methionine, whey protein contains all the amino acids the body needs in the best balance yet discovered in any food. Whey protein is derived from milk. Lactase enzyme was added to aid in the digestion of the small amount of lactose in this product. Those who are sensitive to milk products may be able to tolerate this whey protein, however, if you are allergic to milk and milk products, use PaleoMeal™ under the guidance of your health care practitioner. PurePea™, a natural pea protein isolate, offers a high level of functionality and nutritional benefits. It is ideal for those who are looking for vegetarian protein and may not want dairy derived protein. 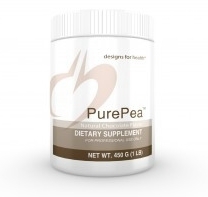 PurePea™ is a true vegan protein which has high bioavailability and excellent digestibility. It comes in chocolate, vanilla and unflavored. As pea protein has ACE inhibitory activity, it may have a positive effect on the maintenance of normal blood pressure levels. It has also been shown, in rat studies, to have a positive impact on total cholesterol and very low density lipoproteins (VLDL) by stimulating bile acid formation and excretion. When compared to other vegetables, the yellow peas used in PurePea™ have low levels of phytosteroids (isoflavones), thus minimizing the possible estrogenic effects. PurePea™ is a great protein source for athletes and anyone who is physically active. Cocommune Bars™ are gluten-free and contain no sucrose, fructose or soy protein. They contain only natural sweeteners (inulin, maltitol, stevia and erythritol) that are easily tolerated and less prone to effect those with GI sensitivities. The generous amounts of coconut and coconut oil greatly contribute to the bar’s immune boosting properties and provide their moist, creamy and great tasting filling. With a blend of rich dark chocolate for their outer coating, the result is a taste that will even rival a Mounds® bar! Chocolate Mint Fiber Bar is a delicious, high fiber bar containing a generous 14 g of dietary fiber per serving (one bar). It features Fibersol®-2, a digestion resistant, soluble dietary fiber that helps maintain intestinal regularity. This bar also contains inulin and isomalto-oligosaccharides, prebiotic fibers that benefit GI health through their ability to support gut microbiota. Chocolate Mint Fiber Bar does not contain any fructose or sucrose. It is sweetened with the health-promoting polyols erythritol and maltitol syrup, along with the natural herb stevia. The combination of fiber and polyols yields only 2 net carbs per bar, making it an ideal low glycemic, high fiber snack. There is also a dairy free version available which is higher in protein. 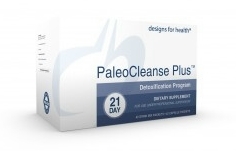 PaleoCleanse Plus™ is a comprehensive, science-based nutritional program designed to support safe and effective detoxification. This is accomplished by providing the nutrients needed to support and balance phase I and II metabolic pathways and to promote healthy liver function and elimination. Everything is consolidated into packets to make the program easy to follow and to ensure that individuals on the program do not miss any necessary nutrients. See the store website for more details, or contact me. This pure 750 mg Betaine Hydrochloride tablet is designed for patients with compromised hydrochloric acid production. Ideally, Betaine HCl should be taken right before meals. Each tablet is coated with a vanillin pharmaceutical glaze because of Betaine HCl’s strong odor. It is Not recommended for patients with ulcers or a history of ulcers. 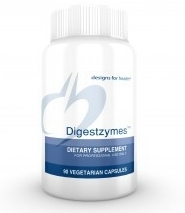 Digestzymes™ is comprised of a proprietary blend of digestive enzymes along with betaine HCL to support optimal digestion of proteins, fats, and carbohydrates. This product contains the special protease DPP IV (dipeptidyl peptidase IV), which aids in the breakdown of casomorphin (from casein) and gluteomorphin (from gluten). Digestzymes™ also include the enzyme lactase, which helps break down the dairy sugar lactose. The use of Digestzymes™ before meals may be helpful when patients experience gas and bloating after eating, constipation, or a feeling of fullness after eating only a small quantity of food. In order to assimilate vitamins and nutrients from our food and supplements, we must be able to digest them properly. Studies show that the foods in the typical American diet are devoid of natural enzymes and do little to help secrete our own production of enzymes. Thus, foods do not get digested well and nutrients from food are poorly absorbed. Poor digestive health can lead to various health disorders. 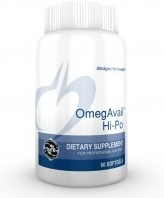 OmegAvail™ Hi-Po provides a potent 1400mg of EPA/DHA omega-3 oils per serving. Only Designs for Health fish oil products carry the TruTG™ seal, which are delivered in the form found in nature and are of superior TG potency. The TruTG™ seal guarantees a minimum 90% triglyceride-bound (TG) omega-3 fish oils, a level that is 40% – 50% higher than the industry standard for most TG fish oil concentrate products. As always, our fish oils are molecularly distilled and filtered to ensure purity and to maximize the removal of heavy metals, pesticides, solvents, PCBs, and other contaminants. 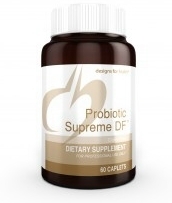 Probiotic Supreme DF™ is a higher dose, dairy-free alternative to our Probiotic Synergy™, delivering 15 billion organisms per dose in a caplet form – and uses the same advanced patented delivery system to ensure delivery of the highest number of live organisms to the intestinal tract. 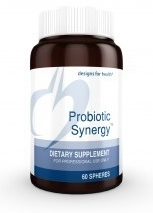 As the probiotics are meant to release over an extended time frame (10-12 hours), effective dosing need only take place twice per day. This also ensures delivery throughout the entire intestinal tract. Vitamin D Synergy provides a clinically useful dose of vitamin D3 and vitamin K in the form of K1. This formula can be replaced with Vitamin D Supreme when more aggressive therapeutic levels of vitamin D and K are required clinically. Vitamins D and K are essential for optimal bone and arterial health and for maintaining the immune system in proper balance. You should get tested at least once a year for your Vitamin D levels. Twice Daily Multi™ contains optimal amounts of many nutrients not easily obtained in most diets. It uses higher quality ingredients than most multivitamins, including vitamin E as high gamma mixed-tocopherols, our proprietary NatureFolate™ blend of active isomer naturally-occurring folates, and TRAACS® true amino acid chelate minerals for optimal tolerance and absorption. These exceptional ingredients are combined in an up-to-date, science-based formulation to create a truly superior multi. MagCitrate Powder provides 300 mg of magnesium in each one teaspoon serving – a convenient delivery system in a great-tasting lemon flavored powder. It mixes well in water and is very easy to titrate when higher doses are needed. MagCitrate Powder helps promote bowel relaxation when fiber alone is not enough. This product also supports the ability to fall asleep, and can be taken along with our Inositol powder for a restful night’s sleep.